Jeep makes a conclusive compact SUV statement with the latest turbo-diesel Jeep Compass. Offering much more grunt low down than the petrol alternative, the 2018 Jeep Compass Diesel SUV is nice to drive, roomy and more than capable of taking you off-road. Don’t you love the excitement of new things? This is a new Compass with fresh looks and plenty of new technologies to get enthusiastic about. Known as a compact SUV, the 2018 Jeep Compass Diesel models have all the bells-and-whistles. If you want the turbo-diesel power, then the Limited and Trailhawk versions are linked to this excellent engine providing superior comfort, and a ruggedness and style linked to more upmarket compact SUVs. Limited and Trailhawk models get soft plastics, leather and touches of chrome surrounds in the interior to make the cabin feel more luxurious and expensive. The lower sections of the doors use a harder plastic which although functional can look a bit cheap if you expected more from a Limited version. Limited versions do provide a quality soft leather steering wheel with multi-function abilities, and a nice mix of leather and textile fabric for the seat upholstery. There are standard versions of the Compass that are known as the Sport and Longitude models, but they are only offered with petrol power plants. 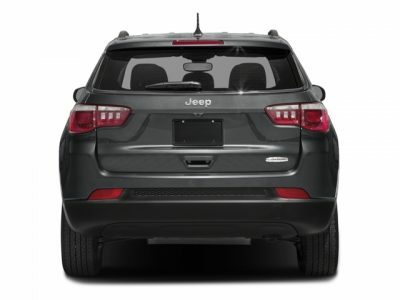 In the rear, the new Jeep Compass Diesel SUV does provide class-leading knee, leg and head room. Three adults can easily fit across the rear seats, and there is a middle section in the rear seats which folds down and provides arm rest support and two cup holders. Front seat occupants have no problems getting comfortable either, and there is a full expanse of seat and steering wheel adjustment to get the perfect driving position for the driver. Handy storage compartments for bottles, torches, maps and other paraphernalia are present throughout the cabin in good quantity – some are smaller spaces than others but all-in-all a good spread of little storage booths. 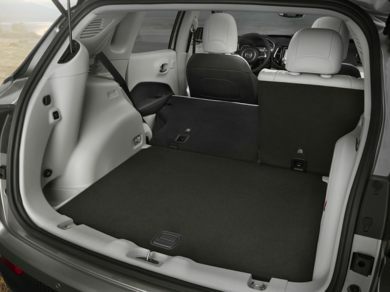 Luggage space in the boot offers almost 500 litres with the rear seats in place; and if you fold the rear seats down there is a huge area for cargo – the rear seats are split folding. Keeping up with communications while travelling in a new Jeep Compass Diesel is a breeze. There is Smartphone connectivity and Bluetooth functions. The centre dash display screen is an excellent system that connects you to live streaming, satellite navigation and phone operations. Media, radio, climate controls, App functions, on-board information and controls, satellite navigation and phone can all be accessed via this main control centre. The touch-display operates seat heating and climate control as well, so it’s all pretty handy. Once you’re used to operating via the touchscreen gestures it’s all pretty easy to use. However, you can also operate essential functions using the button console lower down underneath the touch screen, and you can also drive some features via the steering wheel. Jeep’s UConnect gives occupants latest Apple CarPlay and Android Auto entertainment. 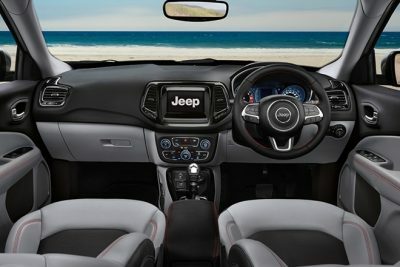 Limited Jeep Compass Diesel models offer a range luxury features as standard and these include: dual-zone air-conditioning, cruise control with a speed limiter, electric windows, electric mirrors, parking sensors, electric parking brake and heated seats. Bi-Xenon headlights, a nine-speaker premium audio system, adaptive cruise control, a powered tailgate and a rear-view camera are some of the Limited Compass items. Drive a Limited and you’ll be comfortable and very well catered to. Every 2018 Compass comes with the full array of airbags, ESC, and ABS as standard but there is also autonomous emergency braking, lane keeping assist, and hill start control. ANCAP safety testing has awarded the new Jeep Compass the full five-stars in crash testing. Don’t you just love the fresh smell of a new morning, the glistening blue ocean and the colours of Australian cloud formations? Driving around Australia in a 2018 Jeep Compass sounds very appealing indeed. Choose the Diesel Compass models, and you’ll have all the grunt you’ll need for passing, cruising or even off-roading. Boasting a 2.0-litre turbo-diesel with 380 Nm of torque available from low down in the revs makes cruising the motorway effortless and quiet. A nine-speed auto is the ‘bees knees’! Tackle off-road sections with ease thanks to Jeeps superior 4×4 AWD capabilities which can deliver power to any of the four wheels as necessary. Jeep claim the diesel Compass can sprint from 0-100 km/h in less than ten seconds making it more than swift enough for most users. Let’s face it; the majority of Compass buyers will be more than satisfied with their 4×4 SUV managing that sort of acceleration. Ride quality is good and the Compass has well-sorted handling and decent brakes. Fuel economy is good too, and you should easily average 8 litres/100 km or less when being normal with your right foot. If off-roading is your passion, then the Trailhawk Compass Diesel will deliver a vigorous off-road experience with phenomenal grip and control when the going gets tough. This model also has all the off-road accessories as well as better approach and departure angles. Rock mode and Hill Descent Control are part of the Trailhawk’s repertoire. One to enjoy, and I think you should be impressed with Jeeps brand new compact 2018 Jeep Compass Diesel models.